Over the weekend, huge numbers of travelers in Europe faced the headache of a cancelled flight. Pilots at Lufthansa, a major German airline, went on strike for better pay and a new contract, and as of Monday afternoon, the strike has not yet been resolved. 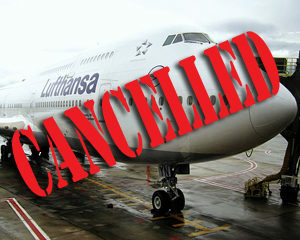 Thousands of flights have been cancelled already, and there will be many more cancellations until the Lufthansa pilots end the strike and go back to work. It’s estimated that between 1-3% of flights are cancelled each year. That might not sound like a large number, until you consider that it works out to more than 100,000 flights in the United States alone! If you travel with any regularity, you’re likely to find yourself the victim of a cancelled flight sooner or later. Read on to learn more about flight cancellations and what to do if your flight is a no-go. There are many reasons why flights may be cancelled. One of the most common is the one we all think of this time of year: the weather. 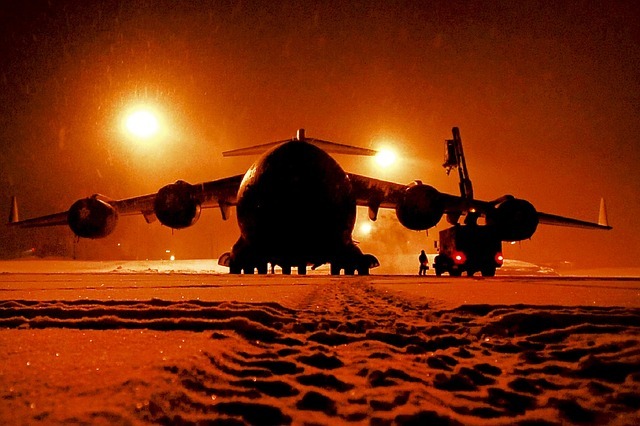 A major snowstorm can shut down an airport entirely! Snowstorms can cause flight cancellations even in parts of the country that never see a single snowflake. Your flight from Miami to Los Angeles could be cancelled due to snow if the airplane you were meant to fly on is stuck in a blizzard in Boston! Winter storms aren’t the only weather events that can snarl air traffic around the nation. Hurricanes, wildfires, and even volcanic eruptions have led to thousands of cancelled flights. Even a plain old thunderstorm can keep a plane grounded! Maintenance issues. A maintenance crew will be checking your plane before your flight, and if they find a problem they can’t fix quickly, the flight will be cancelled. But that’s fine — you don’t want your plane to break down in the air! Crew scheduling. Pilots and other flight crew members are only allowed to work a certain number of hours in a row, to prevent them from getting over-tired. (You don’t want your pilot nodding off any more than you want to fly on a broken plane!) Sometimes it’s discovered too late that the crew have already flown too many hours, and the flight may be cancelled if replacement crew can’t be found in time. Strikes. The Lufthansa pilot strike going on now is a prime example of the havoc a strike can cause. Pilots aren’t the only ones who can strike — we’ve seen problems caused by strikes from air traffic controllers and even baggage handlers! Lack of passengers. If your flight has too many empty seats, it won’t be profitable for the airline to run your flight. They may cancel your flight and book you on a different departure. In a nutshell, if your flight is cancelled, you are entitled to either get a refund of the cost of your ticket, or your airline needs to rebook you onto another flight. But you might be able to get more than that! In some cases, the airline may pay for you to get a hotel room, meals, a rental car, or taxi service to another airport. Those details are all contained within the Contract of Carriage. Every time you buy an air ticket, you are agreeing to the airline’s Contract of Carriage. That contract will spell out exactly what your rights are in the event of a cancelled flight. You can find your airline’s full Contract of Carriage on their website. We admit that most travelers never bother to read the contract! But if you find yourself grounded after a flight is cancelled, you can check the contract to find out exactly what you are entitled to receive. Most airlines lump cancellations into two different categories – cancellations caused by problems in their own operations (like maintenance issues) and “force majeure” events. “Force majeure” events are situations outside of the airline’s control, such as storms, strikes, or terrorist attacks. Typically, if your cancellation is considered “force majeure,” all the airline will do is to either give you a refund or find you an alternate way to your destination. If the cancellation is caused by a problem they admit is their own, they are more likely to give you perks like free hotel rooms. You’re at the airport, waiting at the gate, and the dreaded announcement is made: your flight has been cancelled. What do you do next? Get in line at the gate agent desk. The gate agent has the power to rebook you onto a different flight to your destination. As soon as you hear the flight is cancelled, MOVE! The people in the front of the line are the ones who are most likely to get booked on the earliest alternative flights. Call the airline. While you’re waiting in line to speak to an agent at the airport, call the airline from your cell phone. The phone agents will also be able to assist you in getting rebooked. Consider all your alternatives. If your airline doesn’t have another available flight, perhaps another airline does. (Yes, your airline can, will, and should pay for you to fly on a different airline if that’s what it takes to get to your destination!) No flights available from your airport? Widen your search to other nearby airports, or consider if a train, bus, or rental car could get you to your destination more quickly. Get a room. If you are dealing with an event like a winter storm that is impacting the entire airport, reserve a room at a nearby hotel ASAP. During major storms, the hotels near the airport will fill up quickly. Trust us, you don’t want to spend the night sleeping on a row of chairs at the gate. Call your travel insurance company. This is exactly why you buy travel insurance! Contact your insurance company and find out what benefits you can get, such as paying for a room at a hotel near the airport. Have you ever had to deal with a cancelled flight? What did you do?